A recent article in the Encyclopedia of Puget Sound describes legislation to make shipping fossil fuels through the Salish Sea safer. It’s all about tug boats and the speed of ships and modeling risk. At no point in the discussion–either in the article, or in the legislature–is there any mention of whether it is sane or just to be shipping ANY fossil fuels through the Salish Sea, given the catastrophic devastation that would occur if there is a major spill, and given the catastrophic devastation that will occur when those fossil fuels are burned or turned into plastic. It’s like the doctors in the concentration camps in Nazi Germany who helped sick prisoners by sneaking them an extra piece of bread, or keeping them in the sick ward just an extra day or two to let them rest. These doctors did what they could to alleviate the suffering, but at no time did they question the sanity of the system–the concentration camps themselves. We who wish for no fossil fuel shipments at all are not the crazy ones. It is the system that is insane. It is the system that must be stopped. Until we stop the system, we are simply putting a bandaid on a wound, while enabling an insane system to continue killing everything around us. We spend a lot of time and energy on bandaids. We could and should be spending that time and energy stopping the system instead. In 2018 there were about 10,000 vessel transits (to and fro) through the Salish Sea including tank barges, cargo and passenger ships, articulated barges, and tanker ships. This is expected to increase dramatically in the coming years with container and grain ships, additional oil tankers, Xylene tankers, and an unknown number of ships associated with 12 LNG projects around the Salish Sea currently under development. In 2016, a total of 450 million barrels of oil were shipped by ship, rail, and pipeline through Washington State and the Salish Sea. 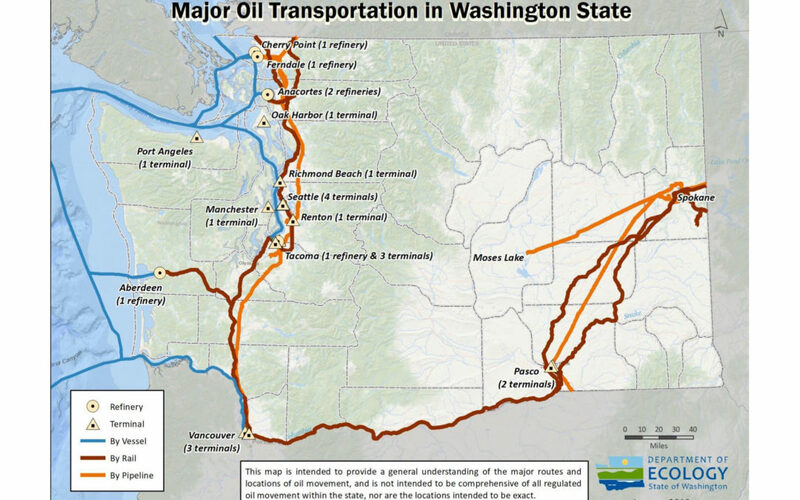 Oil shipment map from the WA State Department of Ecology.